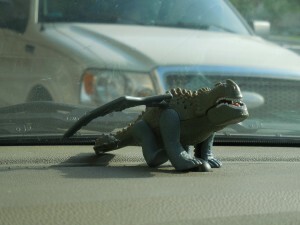 I got my car back this morning from the transmission people and the first thing I saw was my little buddy on the dash. I missed him or is it a her? I bet he/she gives the odd pedestrian a bit of a fright when they spot it! Very cool! I have always imagined it was a she and she is a very good guard dragon. Of course she has a big appetite. Finishes off all the stray bugs that get in the car.